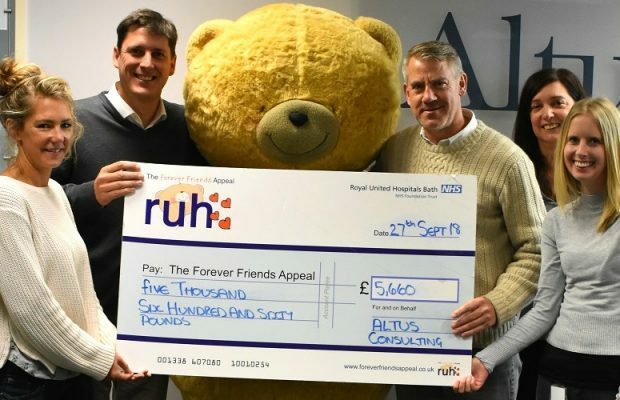 Bath financial services company, Altus Consulting, has raised nearly £6,000 for the children’s ward at the Royal United Hospitals, Bath with a corporate Golf Day. Taking place on 21 September and involving 60 of Altus Consulting’s clients, the event raised funds through registration fees, a raffle, sales of ‘Mulligans’ and the opportunity to beat professional player, Russell Covey. Martyn Evans, head of consulting, Altus Consulting said: “This is the first time we have used our corporate golf day to raise money for charity – we chose to raise funds for our local hospital as a colleague of ours had one of their twin girls born with a serious heart condition last year. Laura Rankin, corporate officer, The Forever Friends Appeal said: “On behalf of the Appeal, I’d like to thank everyone at Altus Consultancy for raising funds for our Children’s ward. The Forever Friends Appeal is the principal fundraising charity for the Royal United Hospitals, Bath. As well as fundraising for “major campaigns,” it raises funds for the hospital’s wards and departments to pay for “state-of-the-art” medical equipment and facilities, research and innovations, staff training and the creation of “welcoming and highly beneficial” healing environments for its patients and their families. If your place of work is interested in supporting The Forever Friends Appeal, contact Laura Rankin on 01225 825392, email: laura.rankin@nhs.net or visit: www.foreverfriendsappeal.co.uk. Pictured above: Staff at Altus Consulting presenting the cheque to the RUH’s charity, The Forever Friends Appeal.